Call me old fashioned, but the purpose of a business is to turn a profit. No matter what kind of company you build,or how much loss you pull over the course of the company’s growth, the company has to be able to generate a profit eventually, and that alone is the sign of true success. Starting a business typically involves some costs, usually in the form of investment and operating costs. For example, in the case of an app company, the initial investment would likely be for computers and furniture; while the operational cost, would be rent, salary, etc., which is recurring in nature. If an entrepreneur is able to earn a sufficient amount of money to cover the cost of operations, he/ she has reached operational break-even. In other words, the entrepreneur no longer needs to invest additional money just to keep the business going. When he/ she is able to recover the upfront cost of investment as well (i.e. computers, furniture, etc. ), he/ she would have reached business break-even. Quite often, the price of the app is low, say Rs. 100. As shown above, if themonthly operating cost is Rs. 100,000, the entrepreneur would needat least 1,000 downloads each month to reach operational break-even. If the app is downloaded more than 1,000 times each month, the business is operationally profitable. Under normal conditions, reaching 10,000 downloads a month would take a fairly long time as well as certain infrastructure:an office, employees, support staff, etc. to grow to such a number. To achieve this goal,the business needs to lease a larger office, hire more people, and spend on marketing and sales activities, among other things. This implieshigher operating costs, of say,Rs. 500,000. 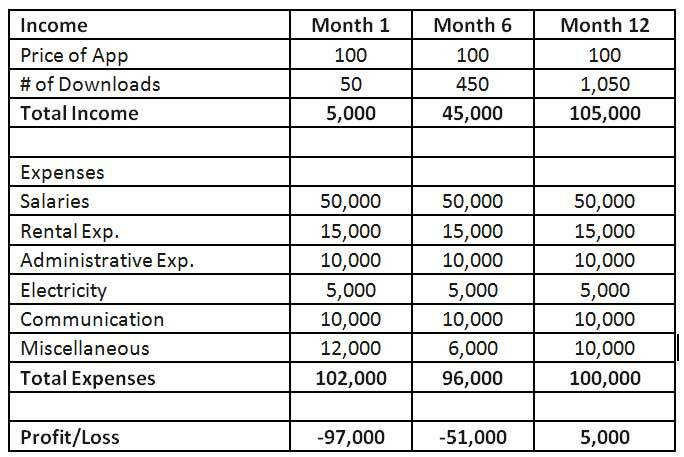 This increased operating cost means that in order to achieve break-even, the business now needs 5,000 downloads per month.Until then, the business will be losing money. To cover the cost of operations during this period of rapid growth, the entrepreneur would need investment. This is the point at which you start approaching investors, to enable high speed growth called – Scaling Up. Up until now, I have talked about the costs of setting up a business and the importance of finding the right customer. I used the example of an app priced at Rs. 100 per download that needs a 1,000 downloads per month to reach operational break-even. I will use a slightly different example to discuss challenges in setting the right price. In the example, since the product that was being sold was a software, there is no distribution cost or tangible product cost that the company in question would be incurring. Let us turn to a business that is selling, say, food. There is a 'cost of food' that needs to be borne, which economists like to call a ‘variable cost’ since it moves up and down based on the amount sold. If we find that the price of putting a meal together in this business is Rs. 100, and that the cost of delivery (also a variable cost) addsRs. 30, it is obvious that the business must sell this dish at more than Rs. 130. If the price per meal were Rs. 150 and the operating cost (rent, salary, etc.) is Rs. 100,000/month, the business would have to sell 5,000 meals a month to break-even. There is no scenario where selling the meal for Rs. 120 would result in a profitable venture. Thecost of a unit cannot be higher than its selling price. This is called 'Unit Economics’; how much does it cost to make one unit of something. If a business is selling more of it,economies of scale may bring cost of production down, but this tends to be a small percentage of the cost most of the time. For example, it is unlikely that the cost would fall by 50% without acorresponding change in technology or manufacturing process. Every startup begins by going after a niche customer because it is easy to create value under such well-defined conditions. Niche markets tend to be small and so, it is unlikely that an established player would focus on them. Once the niche has been satisfied, the business expands its range of offerings to cater to a larger market. When you start a business with a loss making model, you are attracting customers who are with you only because you are cheap, not because you they find the product/service valuable. Birds of a feather flock together. Hence, all of the customers that you attract will be of the same nature; this is not particularly great news from the perspective of growing the business. It is very easy for another competitor to drop their prices and take your customers away. Their loyalty to your business will be non-existent. Personally, I would rather not have any customers than have a bunch of bad customers.Niche customers will pay because they see value. When the food business mentioned above begins operations, it obviously would not be profitable even if priced correctly, because it will not sell 5,000 meals a month at the outset. So then, the question becomes: in the absence of profit how do you evaluate a business? This is the conundrum with which investors are faced with. Humans do not know how to value the things that they cannot measure, which makes evaluating an unprofitable business challenging.Investors often love to associate the value of the firm with a number that seems to be going up. Take gross merchandise value or number of active users or number of meals sold: any number that can be plotted on a graph. In other words, this would amount to cherry picking numbers which make the graph seem to be pointed upward. Some entrepreneurs mistakenly begin to focus on the same numbers instead of looking at the path to profitability. Focusing on rising numbers before establishing a causal link between them and profitability is pointless. Consider the example of Twitter. The argument that Twitter is a bad product, or that it does not serve any purpose, is untenable. But Twitter, as a business, has never been profitable. Since its valuation was heavily influenced by the number of users who had signed up,investors pushed for strong user growth (which in turn impacted their valuation), without paying much attention to revenue sources. Once the business was listed, they had to find a way to ensure that the company was profitable, because the shareholders did not want to see a loss making business.The valuation of a business, according to finance, is directly related to its ability to profit. Twitter has great content play, both in terms of curated content, which the users are themselves curating, as well as breaking news. Today, the company is finally beginning to focus on these pieces because the money will be generated when these pieces are highlighted and leveraged. Consider the example of an app where number of monthly downloads grew from 1,000 to 10,000.Based on the state of the business and the growth rate projected, the proposed valuation can be 10 times higher as well. One may tell future investors that 100,000 downloads per month is the goal, the business would be wildly profitable at that point, and hence it is in their interest to own a part of it. At this point, the original investor would exit the business with 10X returns and hopefully, the entrepreneur is left with a business which has a healthy future and a set of great long-term investors. When the app hits the 5,000 downloads per month mark, the business will begin to generate profits. The investor is certain to ask the entrepreneur to re-invest this profit back into the business to accelerate the path to 10,000 downloads per month. When a business is growing fast, nobody focuses on the profits.They assume it will materialize as the company grows. When growth slows, everybody wants to see the profits. One of the greatest negative externalities of a business like Facebook being successful, is that many entrepreneurs tend to assume that they can build a business with no idea of how to achieve profitability, and that as the scale grows, the path to profitability will magically appear.We will ‘invent' new revenue models! Firefighting problems is a lot easier when the scale is smaller. It is much easier to experiment with a variety of products and solutions when there are fewer users. It helps one figure out the route that would result in profitability. As scale grows, there are a variety of other issues that require attention, which take up increasingly amounts of time and make it difficult to focus on fundamental issues. Entrepreneurs often counter logical arguments with statements like, ‘Facebook did it, Google did it, why can’t I?' Well, let us make a list of all the startups in the world since 1995 and see how many successful ones figured their revenue models post launch and scale-up versus how many successful ones figured out their revenue model prior to launch and scale-up. The latter would certainly outnumber the former. So my answer is: Einstein came up with the theory of relativity, why can’t you? Google and Facebook are exceptions. They managed to defy what is commonly seen in business. There is a difference between the exception and the rule. Unfortunately, we pay more attention to the exceptions; and for obvious reasons – they are exceptional! This causes many entrepreneurs to assume that this path is normal. In most exceptional businesses, there is often an exceptional factor that contributes toward its success. That factor may be the founder, the vision, the culture, the belief, the connections that they have, the approach that they are taking, the availability of a latent market: it could be a variety of things. Invariably these things are hard to measure, predict or replicate. Hence, it becomes extremely difficult to pinpoint the precise factor that contributed toward such exceptional success. If we can’t pin down what made something exceptional (if we could, wouldn’t we all be exceptional?! ), the best approach is to work under the assumption that you are normal. If you do have that exceptional spark, things will turn out even more awesome! A business that is built to be profitable is more likely to do well. Stumbling across an exceptional element at some point will give it the potential to be hugely profitable. In other words, fundamentals matter! Focus on great customers and great fundamentals to build a viable business.